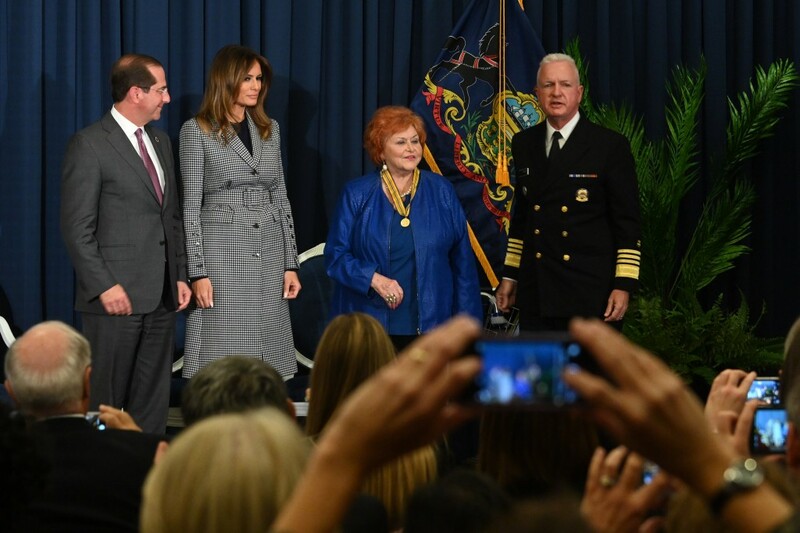 Longtime Avalon resident Dr. Loretta Finnegan was honored by First Lady Melania Trump and other officials during Mrs. Trump’s visit to Thomas Jefferson University Hospital on Wednesday, October 17th. Mrs. Trump delivered the welcoming remarks at the National Convening on Neonatal Abstinence Syndrome hosted by the Department of Health and Human Services. During Mrs. Trump’s visit, she visited with the Maternal Addiction Treatment Education and Research (MATER) program. The White House provided an official statement from Mrs. Trump following the visit which states, “I am inspired by Dr. Loretta Finnegan’s lifetime dedication to helping children and look forward to learning more about HHS’s plans to develop and implement their new tracking program”. Dr. Finnegan was presented with The Surgeon General’s Medallion by United States Health and Human Services Secretary Alex Azar, Assistant Secretary for Health, Brett Giroir, and the First Lady. The Medallion has not been given to a civilian in five years. Dr. Finnegan received the Medallion for “pioneering leadership and innovative performance both as a clinician and Executive Officer of the College on Problems of Drug Dependence, and for the Finnegan Score, a groundbreaking key assessment tool for babies born with neonatal abstinence syndrome (NAS) which remains widely used across the United States, and around the globe”. “Dr. Finnegan’s Avalon family is absolutely thrilled that the highest level of federal government took time to recognize her incredible efforts in helping newborns who suffer from opioid withdraw and other serious health issues”, said Avalon Mayor Martin Pagliughi. “She has worked tirelessly on behalf of newborns and our community joins together in recognizing her outstanding achievements which have earned high recognition from the White House”. Dr. Finnegan is a graduate of Drexel University’s College of Medicine and served as a professor of pediatrics, psychiatry and human behavior for 16 years. She advanced to a position as a Senior Medical Advisor for the National Institutes of Health and most recently has served as an Executive Officer for the College on Problems of Drug Dependence, Inc.
Photo courtesy of the Department of Health and Human Services.